SEOUL – South Korean prosecutors charged Samsung Group [SARG.UL] chief Jay Y. Lee with bribery and embezzlement on Tuesday as the top conglomerate announced the dismantling of its corporate strategy office, the latest developments in a graft scandal that has rocked the country. Jay Y. Lee, 48, was arrested on Feb. 17 over his alleged role in the corruption scandal involving impeached President Park Geun-hye, dealing a fresh blow to the standard-bearer for Asia’s fourth-largest economy. The special prosecutor’s office said on Tuesday, the last day of its investigation, that it had charged Lee, third-generation leader of the tech giant “chaebol”, and four other executives with bribery and embezzlement. The charges against Lee included pledging bribes to a company and organizations tied to Park’s confidant, Choi Soon-sil, the woman at the center of the scandal, to cement his control of the smartphones-to-biopharmaceuticals business empire. “We apologize for the social controversy and distress we have caused,” Samsung Group Executive Vice President Lee June told reporters. The charges came ahead of a Constitutional Court ruling on whether to uphold parliament’s December impeachment of Park. That impeachment was triggered by accusations that she colluded with Choi to pressure big businesses, including Samsung, to donate to two foundations set up to back the president’s policy initiatives. The 65-year-old daughter of a former military strongman has had her powers suspended. The Constitutional Court’s ruling is expected sometime in March. Should it uphold the impeachment, Park would become the country’s first democratically elected president to be thrown out of office. While a sitting president cannot be indicted, the special prosecutors nevertheless have classified her as a suspect. They did not disclose specifics of the charges against Lee or other Samsung executives. Samsung Group, which has denied paying bribes to Park or seeking improper favors from her, declined to comment on the indictment. Park, Choi and Lee have all denied wrongdoing. Based on the main charges levied against Lee, he could face up to 20 years in prison if convicted. Lee in December promised to shut Samsung’s corporate strategy office, a key nerve center responsible for major initiatives such as investment in new businesses, amid accusations by politicians that it was a key organ for illicit lobbying efforts. Composed of around 200 employees hand-picked from various affiliates, the office did not exist as a legal entity but wielded enormous power as the instrument of control for the founding Lee family. Samsung said the chief executives and boards of the various affiliates such as Samsung Electronics and Samsung C&T Corp would set their own course going forward. “It is a shock that Samsung completely dismantled the whole office, cutting the link between group affiliates as if it broke up a fleet,” Chung Sun-sup, chief executive of corporate research firm Chaebul.com, said. A Samsung Group spokeswoman said it had not yet decided how the conglomerate would deal with group-level issues such as coordination among affiliates. People familiar with the matter told Reuters in November that Lee was already moving towards more board-centric management to improve governance. The executive became a board member of Samsung Electronics last year, which the sources said signaled a desire to bring the conglomerate’s management practices up to global standards. The prosecutors also charged four others at Samsung with offences including bribery and hiding assets overseas – group Vice Chairman Choi Gee-sung, President Chang Choong-ki, Samsung Electronics President Park Sang-jin and Executive Vice President Hwang Sung-soo. Samsung Group said in its subsequent announcement that Choi, Chang and Park had resigned. Samsung chief Lee is accused of pledging 43 billion won ($38 million) in bribes to a company and organizations backed by President Park’s confidant, Choi, to curry favor and cement his control of the conglomerate. The funding included sponsorship of the equestrian career of Choi’s daughter. Samsung Group also said on Tuesday that it would leave the Korean Equestrian Federation that it heads. 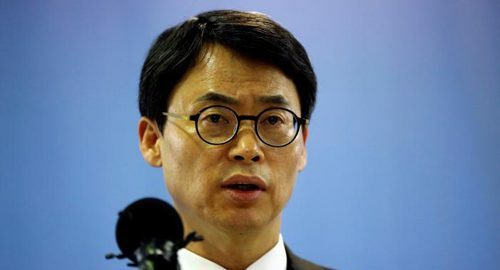 Special prosecution spokesman Lee Kyu-chul told reporters the case against Park would be handed over to regular prosecutors, while signaling other conglomerates may also become involved in the investigation. It was not immediately clear when Lee’s trial would begin.